The Festival season is upon us, I for one thing am going to the Electric Daisy Carnival in London next weekend and literally can't tell you how excited I am! When planning a festival trip it is important to pack light but bring items that are versatile and comfortable and of course, stylish. Coachella kicks off the festivals each year in California and is where we get a sneak glimpse of the festival fashion for the year. This year there were a lot of sunglasses, sandals, shorts and ankle boots and we see the same style throughout the summer at the UK’s Music Festivals. 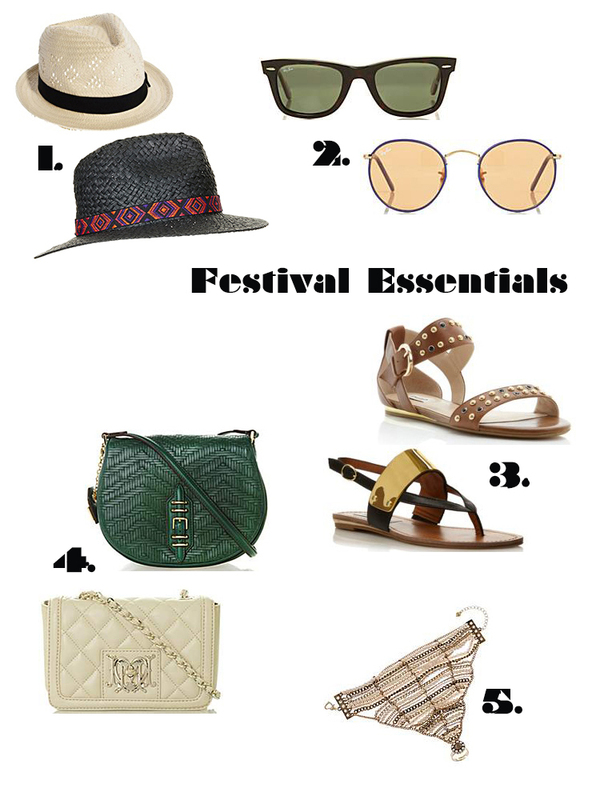 Taking some guidance from Coachella, here is a list of the top 10 fashion essentials for 2013 festival fashion. We don’t get too much sunshine here in the UK but if the sun does make an appearance it is important to be prepared. A cool trilby or cowboy hat looks great and protects your head from the sun’s rays. The lack of showers at festivals plays havoc with your hair so it’s also nice to have the ability to cover it up and still look great. A cool pair of shades can be paired with any outfit to bring some style. Sunglasses help hide the damage from the night before and shade your precious eyes from the glare of the sun before you have had time for your morning caffeine hit. It's a great thing flat sandals are in fashion because they are one of the most versatile footwear items around. Sandals can be paired up with any cute dress, jeans, shorts or skirt and allow you to stay on your feet all day and all night. The wrong handbag can have detrimental effects on your mood at a festival; imagine the awkwardness pushing your way through a crowd with an oversized shoulder bag. A cute cross-over bag is perfect for a festival; you can store all your personal items and still have both hands free for a snack and a bottle of water. No outfit is complete without accessorising, so adding a couple of bangles or bracelets to an outfit can really change the overall look of an outfit. The ankle boot is an essential item for festival goers, on the off chance the weather isn’t 30 degrees and sunny, then you are going to want something that looks cute and is practical. The ankle boot, like the sandal, can be paired up with dresses, jeans, shorts or skirts, and still looks great. A low chunky heel is a good bet when the ground is firm but won’t result in any sinking heels. In recent years the weather through the festival season has not been perfect, shorts are an excellent choice when the weather is damp. Legs can be washed down and dried considerably quicker than trousers or jeans and once again, take up much less space in the bag than a pair of jeans. You need to be a little braver for it but the crop top is the second item on this list that looks great, goes with almost anything and takes up no space at all in your bag. The ideal festival item and my favourite item at the moment. Short dresses are always summer appropriate. The great thing about mini dresses is they don’t take up any room in your bag and a mini dress paired with a pair of leggings is the ideal outfit for a cooler festival day. 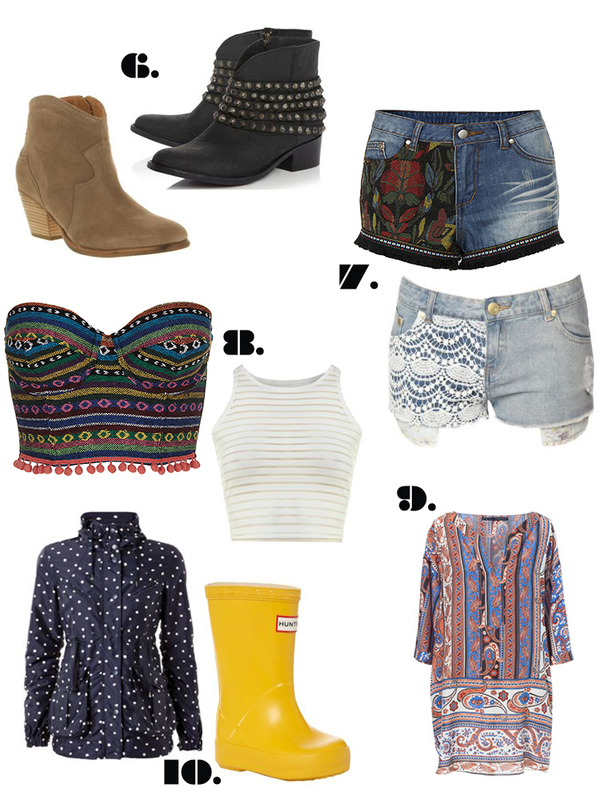 No festival fashion list would be complete without the recommendation of everyone’s festival favourite; the welly. A stylish pair of wellington boots can be paired with any of the items listed above and whatever the weather throws at you, you will be prepared. What are your top 10 essential festival items? Love the gorgeous aztec print crop top.